With half of the new flats this year slated to be built in mature estates, home buyers are cheering the higher chance of getting a home in a coveted location. But some property experts urged young couples not to write off a home in a new estate, which could be friendlier to their budgets than one in a mature neighbourhood. National Development Minister Lawrence Wong said yesterday that half of the 18,000 Build-To-Order (BTO) flats this year will be built in mature estates, in order to meet high demand. PropNex Realty chief executive Mohamed Ismail Gafoor described this as a great opportunity for buyers eyeing such estates. But he said affordability might be an issue for some young couples without enough savings. "BTO flats in mature estates are usually pricier than those in non-mature estates," he said. 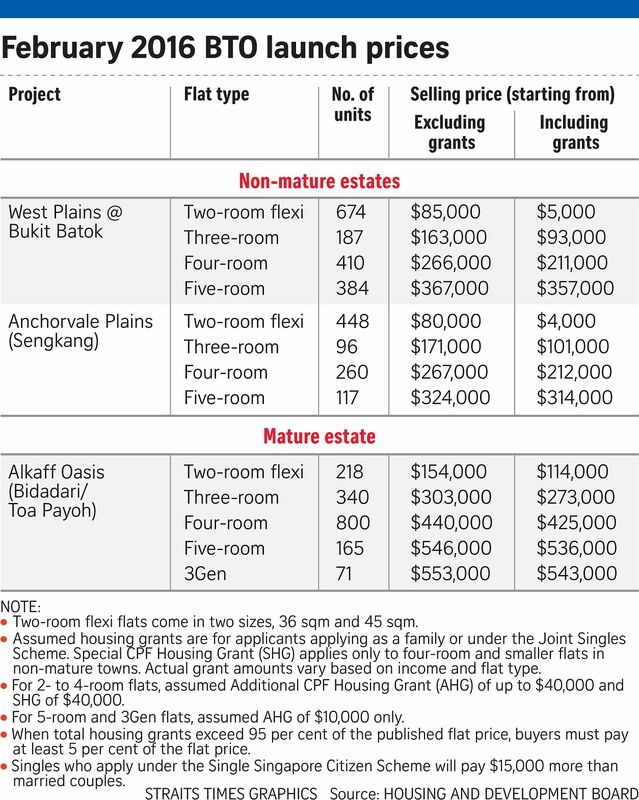 Prices for four-room Bidadari flats in the latest launch, which began yesterday, start from $440,000 before grants. By comparison, their Bukit Batok counterparts go from $266,000. Mr Ismail noted there will still be about 9,000 BTO flats launched in non-mature estates this year. "This is only about 10 per cent fewer than last year's 10,000 flats in non-mature estates, so those who want more affordable units will still have plenty of choice." Mr Wong said that buyers should consider getting flats in non-mature estates, as these are cheaper and there is a better chance of getting a flat quickly. "Every first-timer applying for a flat in a non-mature estate can get it certainly within the second or third try," he said. "We will try our best to have a healthy pipeline of new flats in mature estates. But I would like to say that no matter how many new flats we build in mature estates, it will not be enough to meet the demand." It is a familiar feeling for pilot Yu Shu Qing, 33, and his wife Jasmine Ho, 28, who are applying for a five-room Bidadari flat in their seventh or eighth attempt at applying for a home. "We have lost count already. We are tired of having to apply so many times," said Mr Yu. "Hopefully, more flats in mature estates means we will stand a better chance. But I am also worried that competition will be much steeper because everyone will be rushing for these flats." Mr Wong yesterday also reiterated that there are no plans yet to unwind the Government's property cooling measures, many of which were introduced in 2013 to tame a hot housing market.